The news is full of stories about impoverished children from Central America making the dangerous trek across Mexico to Texas, Arizona, and California. Less noteworthy for the media was the journey of nine Orthodox Christians from Texas, California, Wisconsin, Illinois, New York, and Ohio to the Children’s Residence or “Hogar” of San Miguel del Lago in Guatemala in July 2014. Groups of “missionaries” like ourselves arrive monthly to assist the nuns and staff in caring for Guatemalan children whose parents cannot take care of them. Yes, we were of some help to the children with the extra attention our group provided, especially through games, arts and crafts, and by taking them swimming and to a few other activities. We also did yard work and a few other chores, but for me it was primarily a most blessed retreat for several reasons. First, we displaced ourselves simply by traveling to the Hogar, which is both a home for children and a women’s monastery. We rose early for prayers and went to bed not long after it was dark each night. Evening prayers occurred right before dinner in the common dining room. At the tables designated for visiting missionaries, we ate three times each day the same simple, satisfying food as the nuns, staff, and kids. We became so used to standing for prayer before and after meals that a few members of our group jumped up quickly when I rose slightly to reach the peanut butter near the end of breakfast one day. (It was like a scene from a monastic reality show!) In so many ways, we left the busyness and worries of our usual schedules behind—even wifi was scarce. 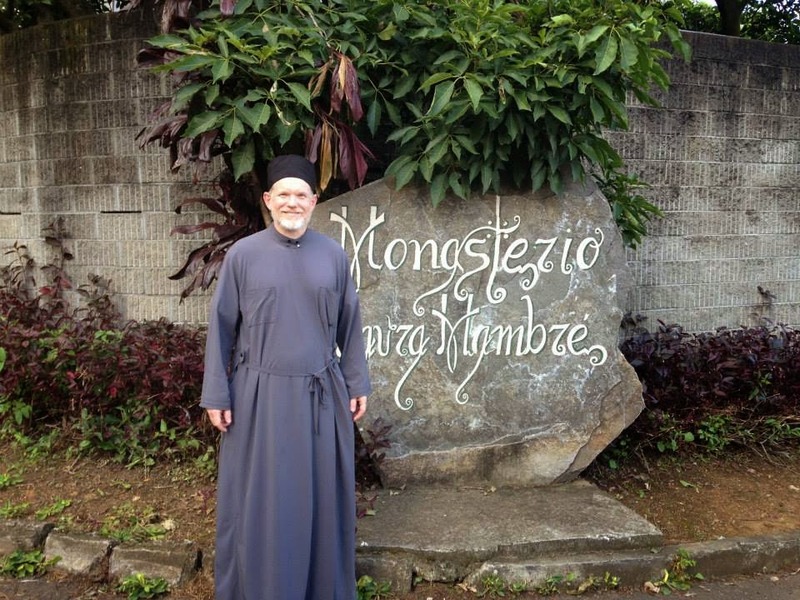 In ways small and large, our lives were reoriented for several days around a schedule shaped by the needs of the children and the routines of a monastic community. In this context, our group bonded quickly with one another as we entered into a different style of life. Second, we did not really know in advance what we would be doing from one day to the next. We had a general idea of the schedule, but the particulars of yard work and activities with the kids (ranging from swimming to arts and crafts and spontaneous play sessions) evolved from day to day in light of what pressing needs arose in the community. As someone normally addicted to a routine, I found it both a challenge and blessing simply to go with the flow. “The Spirit blows where He wills” and it was good for our group of busy, goal-oriented Americans to accept that we were not in charge of the schedule. We learned not to measure a day by what we accomplished, but simply to be grateful for the opportunity to pray and be present with children whose stories are so different from our own. The experience reminded me of caring for our own daughters when they were small, for good days then had little to do with achieving pre-established goals. They had much more to do with simply with being there. Third, the services reminded us that the language in which we pray is irrelevant. With only one fluent Spanish speaker on our team, most of us did not follow every prayer word for word. But that did not hinder our worship, for we all knew the familiar gestures, smells, and patterns of the daily services. The highest form of prayer is without words anyway. Since I am certainly not there yet, the simple words of the Jesus Prayer helped to still my wandering mind more than once. Speaking of language, a bit of practice enabled me to intone a few litanies in apparently understandable Spanish. The first Sunday I served by myself, but my good friend Fr. Chad Hatfield of St. Vladimir’s Seminary presided at the Divine Liturgy on our second Sunday in Guatemala. As he said afterwards, “For two gringos serving in Guatemala, we did pretty well.” As in previous liturgies in Greece, Romania, and Syria, I was reminded of the day of Pentecost, when the Holy Spirit overcame linguistic boundaries. Fourth, we dressed and worked differently than we usually do at home and not according to our own will. As visitors to any monastic community know, modesty is the watchword. And with boys and girls who are expected always to dress modestly, missionaries must set a good example and not become stumbling blocks. So in warm weather that usually calls for shorts and sandals in the US, we wore long pants and tennis shoes. With the exception of time spent doing yard work, I wore my cassock and sometimes a clerical hat. Being hot natured to begin with, I did not mind the cold showers as a way of cooling off. (One day I took three!) Since I make my living as a professor and do as little yard work as possible at home, it was a change of pace to cut grass on a hill with a non-motorized push mower and to spend a few hours pulling weeds. But the spiritual benefits of manual labor and of restraining our own desires about summer clothing just a bit for the sake of others were undoubtedly positive dimensions of our experience. Thank God for circumstances where our own preferences do not always prevail. Yes, it was a mission trip. According to the nuns, our group did its job very well. But as with all things done for the Kingdom, we cannot calculate the results with precision, at least not in this life. That is up to God, not us. What we can do is simply to be thankful for a wonderful retreat in a community of children who, despite their poverty and broken family backgrounds, are blessed by the care of holy nuns and staff members in ways that made us all stand back and give thanks. At the end of the day, they were the missionaries to us. Thank God! Thank you for wonderful insights. Really enjoyed reading about your trip.